I know this thread has been inactive for a few months, but I wanted to add a comment. Based on what I read here, I purchased some Turnigy SK3 motors. They have been great. I used to have Hackers but I sold them in hard times. These SK3's are doing great! I've had several Hackers for different size planes. I will re-outfit them with SK3's. Thanks for a great service Dr. Motor. I want to say thank you for your work. You are correct in the fact that you can lead a horse to water, but you can not make him drink. Many of these people want to think that they are getting something superior by spending the extra money. They also don't want to believe that they could have possibly wasted thousands of dollars over the years. ESCs and motors are made by few factories, and get rebranded all of the time. MAYBE, the higher priced sellers might do some QC themselves, but that is doubtful. These guys that talk about the copper must be lower quality, or the magnets aren't as powerful sound rediculous. These components are such a miniscule part of the price of the motor that it would most likely cost more to keep track of two types of inventory, and they get better prices for buying bulk. I think you have just hit a nerve. I would like someone to look into servos. Maybe you would be interested in this too. so they are the same ? 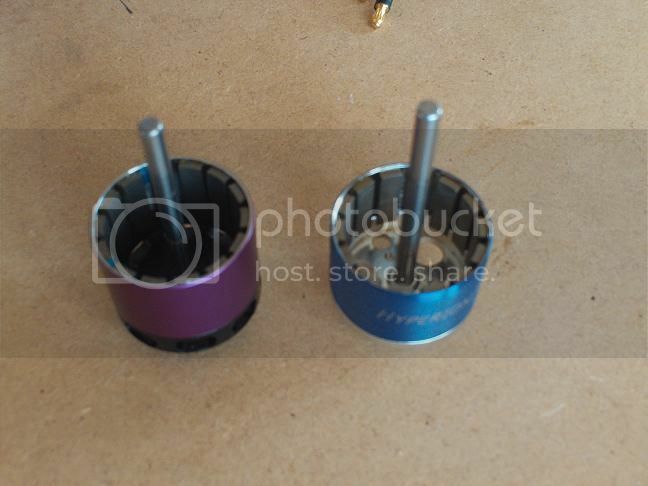 These are clearly not the same motors... These are just comparisons with charts and data range that do not make much sense.. 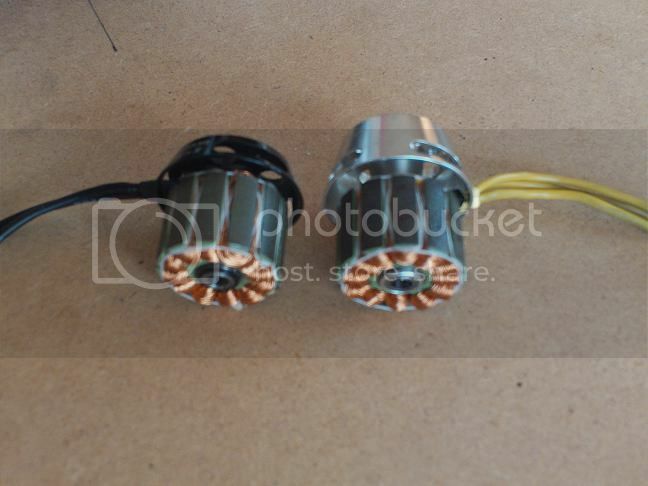 True difference between the motors are seen in their effiency and at higher power levels. Better (and more expensive) motors with higher tolerances and better materials have better effiency. Smaller or cheaper motors have their effiency curves go up and down more earlier and therefore at lower power Turnigy is close to Hacker. In other words smaller gaps (between stator and bell), better magnets and copper produce better effiency (but cost more to make..). Motors also have different bell design and Hacker's design looks to me like it's acting as fan too, which cools the motor when run longer periods which also improves the effiency on longer runs. If you look at DrMotors measurements the "right way" you'll see that the Hacker has higher effiency at whole range. Higher effiency produces more power and less heat at same input power. Heat usually breaks the motors, so higher effiency motors produce more power per watt AND can take more input watts (without breaking up). With biggest props (Highest watts) Hacker's effiency is at 71.9 % and Turnigy at mere 61,1%. That means that Turnigy produces over 30 % more heat at these levels (28.1 % vs 38,9 % of input power goes to heat the motor). Simply put, the Hacker can give more than 30 % more power out without breaking. Usually better (more expensive) motors use better materials which can resist more heat and have better design (airflow), so the difference might be even bigger. DrMotors price comparison is on the wrong track as he is comparing prices in China without taxes and custom duties to local prices in EU with tax and custom duties included. To these chinese prices one needs to add shipping, custom duty and local VAT. Hacker is still more expensive, but it is also much better motor, so you get what you pay for. These motors might even come from the same factory, but that doesn't matter as the factories make what the customer orders. If you order a 30 usd motor, they will make you a 30 usd motor. First question when designing a new product with a factory is the target price.. Same factories make different quality and different price range motors. Here is a chart from DrMotors results with effiency / power. Last edited by VERTICAL Hobby; 03-17-2014 at 02:55 PM. Just so you know I believe Dr Motor and all his different aliases like cteas a few posts above has been banded from the site for harassing via email those who disagree with him. Last edited by Propworn; 03-17-2014 at 04:15 PM. As a person that worked in a failure analysis lab for a major semiconductor manufacturer, and as a person that managed a biomedical engineering repair shop for 15 years, just let me say I find the arguments presented by DrMotor as entertainment value only and not something I would consider using for my own RC motor purchasing decisions. His arguments are erroneous for the many reasons noted by more astute posters. His tests were not to extreme limits nor for extended periods of widely varying operation. In the semiconductor company I worked for, we sold components to the military for about 10X what average commercial buyers paid. The difference was massive testing and the rejection of most batches that were tested. The few batches of chips that passed these extreme tests were the ONLY batches that the militaryc hips came from. The testing cost more than the components themselves. Both the military chips and the commercial chips came from the same company and LOOKED exactly the same. They WERE NOT the same. Batches that could not meet military specs were sold into the commercial market as the "run of the mill" component at the standard commercial price. You could see some of those chips in blister packs at your local Radio Shack for about 10% of what the military contractors paid us for the best stuff. Beyond that, components that are very closely matched to each other will have additional testing costs tacked on to the already high best batch cost. If say 10 components have to be matched, they very few matched sets come out of a batch of chips. That costs extra as well. If a single component in that matched set fails when a product is in final test, then to repair it and retest means that all 10 pieces will probably need replacement unless a single component that exactly matches those 10 matched pieces can be found. For instance, this is why your local stereo/TV repair shop cannot fix Conrad-Johnson high end music amps that used highly matched components that are usually proprietary. The low-to-no-feedback design of C-J does NOT allow out-of-tolerance components as there is no negative feedback to correct for that. Cheap consumer audio products will usually have negative feedback to allow next-out-of-the-box component assembly and have a workable device with reasonable sound that is more easily affordable. Stradivarius violins were not made that way, however, and neither are the best RC motors and speed controllers. DrMotor sounds to me like he might be a shill for a Chinese mass producer of electrical products. The Chinese just do not compete in some areas, like the best headphones, microphones, and stereo cartridges. Those things are design and engineering works of art and not a "copycat" device where "looks" mean they are the same thing. Most of what makes them what they are are not visibly seen so you can tear them down and look at them all you want and you will never discover the secrets that make them what they are. Hooking them up to test equipment and doing simple tests will also lead you nowhere to finding out what makes them what they are. The Chinese have yet to give us something that can pass for a real Fender Telecaster guitar, much less a Steinway piano. They are not into that market. They sell on "looks" that can be had at a cheap price. That is good enough for some folks. They are very good at low end products that have a high labor content. There is nothing wrong with that, as some people want that. Kontronik, Neu Motor, Plettenberg, Scorpion, Novak and some others have nothing to fear from Turnigy. A low price WILL NOT sway them from what they know is a superior product, and they KNOW they pay a high price for that. I am NOT going to give up Conrad-Johnson amps made in Virginia, Denon phono cartridges made in Japan, and AKG headphones made in Austria just because I can pick up vile sounding Chinese junk for chump change, thank you very much. Oh yes, some prostitute audio mag somewhere has somebody saying the cheap Chinese product sounds "just as good" because their test equipment measurement said so. A human being can INSTANTLY tell if a Bosendorfer or Steinway piano is being played, where the most advanced computer systems cannot. Some people are tone deaf and can't tell between a saxophone or a trumpet. That is a personal thing and similarly people will have vastly different requirements and ideas of what a good RC motor or ESC is and how much they are willing to pay. For what it's worth, I remember reading about many different manual ventilators being tested in my biomedical engineering journal. About half of them did not pass the test. All the ones that did NOT pass the test were designed by medical doctors. All the ones that DID pass the test were designed by biomedical engineers. Being a medical doctor is seen as a mark AGAINST you by any biomedical engineer I have ever known as far as electronic devices go, as we have usually had some rather interesting experiences wher e we had to fix things they decided to fix themselves. Circuit boards turned to junk and that sort of thing. Brushing my teeth one morning in the bathroom of the medical university where I got my training, I was talking to a medical student. He had previously been enrolled in electrical engineering but had to quit and go into the medical field because he just could not get "the abstract theory of electrical engineering where everything is mathematically described and calculated and you can't really see what is happening. It was too abstract for me. I have to "see" what is going on in order to get it". DrMotor seems to be in the same boat as that guy, but that guy knew when to quit and go into something that he "got". It is a shame the photos are a little blurred. 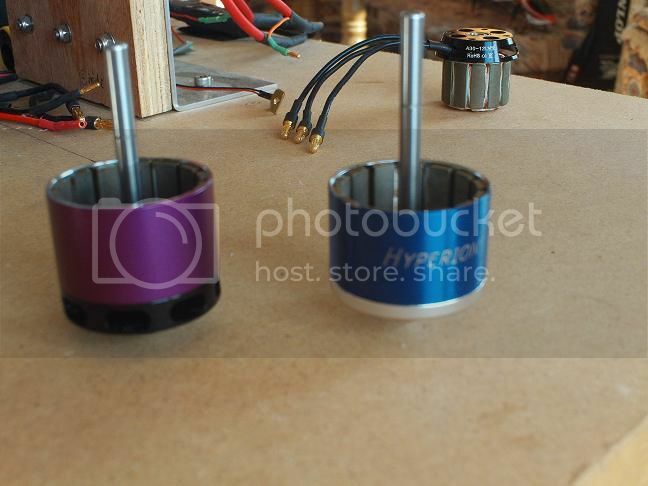 Here are photos of the inside of the HYPERION and the Hacker motors, after the front circlip is removed, and the rotating can is removed from the stator. 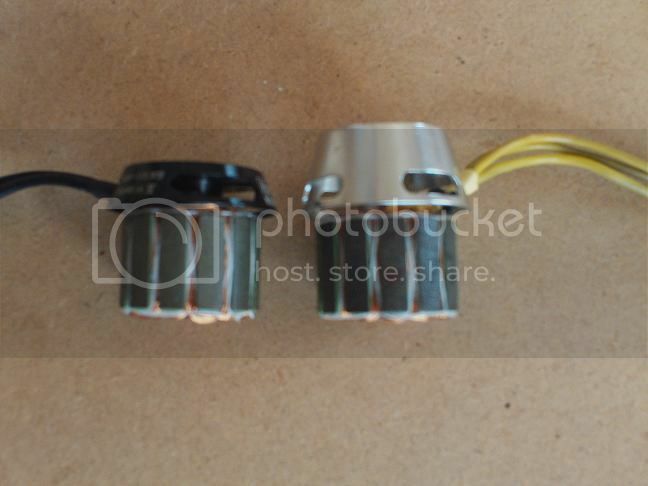 -As you can see, inside, these two motors are identical. b. 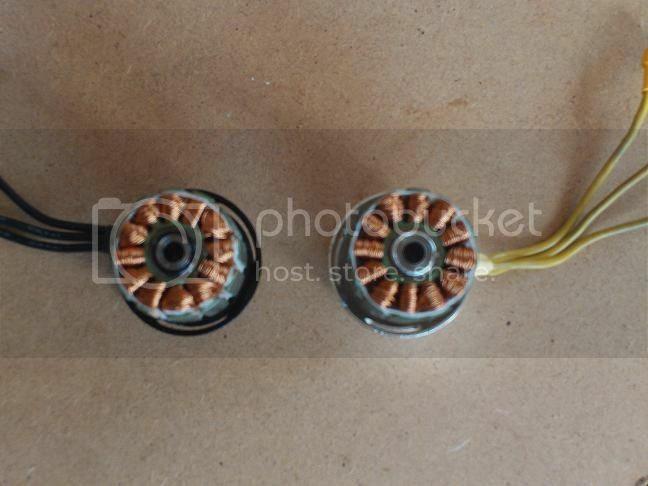 The stator is wound identically for both, and with the same copper wire. c. They have identical bearings. d. They have a very similar shaft -just that the Hyperion shaft is longer because of the longer nose of this motor. f. They both have 14 magnet “poles”, and the 20mm long magnets are identical in both motors. g. And both of the motors have CURVED MAGNETS -i.e. magnets which are curved on their interior surface. the can balancing procedure has been performed. CONCLUSION: Once these two motors are taken apart, and we can see the inside of the motor -it becomes extremely obvious that the HYPERION Z3019-12T and the Hacker A30-12 L are actually the same basic motor. However, even with the slight blur the Hacker windings look a mess. Just an observation. 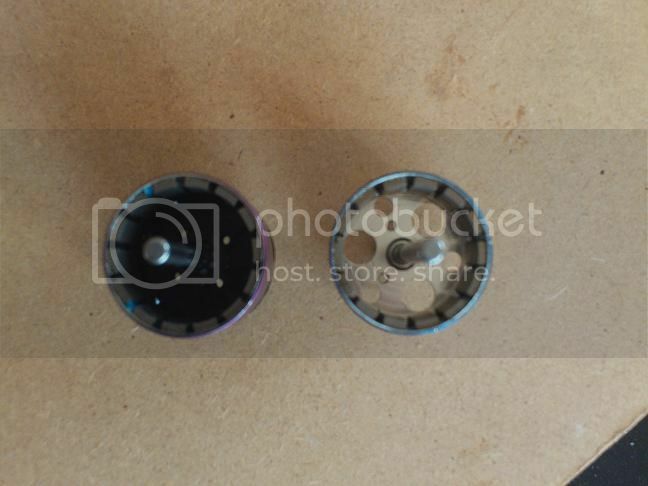 bearings are used in each motor? enamel ( insulation ) used to cover the wire? I ask because the enamel used for the insulation of the wire must not degrade during the life of the motor. Equally the bearings must be constructed from quality steel and packed with a durable lubricant. I just ordered the SK3 1000kv, as it is should be good enough those maiden test flights and potential crashes.When plane will be tweaked properly, I will replace it with a higher quality motor. My question is : I have a couple of Plush 40 amps in my drawer. Can I use it in 4S ? It says burst rates up to 55A, and there is no way I will ever push the throttle to the max.... Or should i forget about it and order a say, 60 amps ESC ? Last edited by philgib; 11-17-2014 at 10:51 PM. Get an SBEC they are more efficient (cheep BEC just waist power by converting power to heat) since you are going to be on half throttle most of the time. Something like Turnigy dlux 55A SBEC Brushless Speed Controller. Last edited by Truebuild; 11-18-2014 at 02:24 AM. I was given this excellent link about this motor. Move to the bottom of the page and have a look at the grid. Run automatic google translatio if ever necessary. One post patting Dr Motor on the back can you say Dr. Motor or is it mini me!!!! Hes known on other forums to log on as multiple personalities to pat him self on the back. Whomever Dr Motor (or any of his other pseudonyms) is at least he has the time/money to buy many motors and inspect then run them on a test rig. Some people may not like what he says; however, the more information we have about the items we purchase for our hobby the better. Let us not let our hobby become like the High Fidelity hobby where a length of copper wire has magical prosperities. I new of him when I made my comment.